Home / Sewing Machine Accessories / Brother & Baby Lock Accessories / Brother/Baby Lock Sewing Machine Accessories / Brother/Baby Lock Cording Foot SALE! Brother/Baby Lock Cording Foot SALE! Fantastic decorative effects are easy with these Brother/Baby Lock Cording Feet. With them, up to seven different lengths of embroidery floss, pearl cotton or high-sheen threads can be sewn in place with the utility or decorative stitch of your choice. 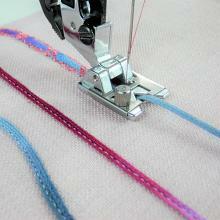 The Brother/Baby Lock Cording Feet are great for couching and making decorative borders and braids. Includes instructions. Use the 3 groove cording foot for thicker yarns, 5 hole cording foot for thinner cords and the 7 hole cording foot for the finest cords.